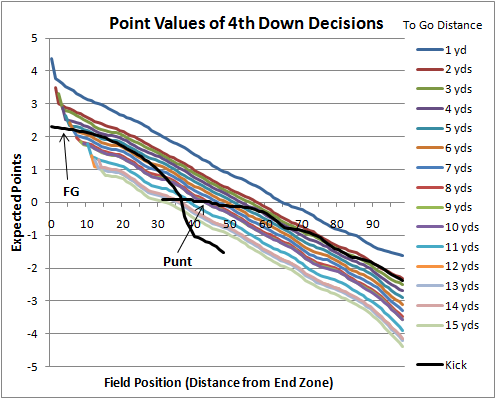 Previous studies on 4th down decision-making include Carroll, Palmer, and Thorn's book Hidden Game of Football (1988, 1998) and Professor David Romer's Do Firms Maximize? (2005). The first serious study of the concepts used in these studies was by former NFL quarterback Virgil Carter, who co-authored an operations research paper examining the value of field position using data from the first 56 plays of the 1969 season. My own analysis published in this post largely repeats the methods used in previous studies. But I think I can add a good deal to the topic. First, this analysis is based on a much larger data set compared to previous research. Second, this analysis offers possible confirmation of previous results. Third, I think I explain a complex, abstract subject such as this in a straightforward manner, which is essential if the 4th down revolution is going to make any headway. Before I go any further, I'm going to take a step back and explain the concept of 'expected outcomes' in general. Say I can choose one of two routes home from work each day. One route is through the side roads, and the other is via the highway. If I take the side roads my commute always takes 20 minutes. So over the long run, the freeway is the better option. Unfortunately, life isn't that simple. We don't have such clear-cut options and we don't know the probabilities and payoff values of our decisions. But in football, we do<!-more->. The EP value of the punt option is relatively straightforward. Based on recent historical data, we know the average net distance for punts from each yard line. 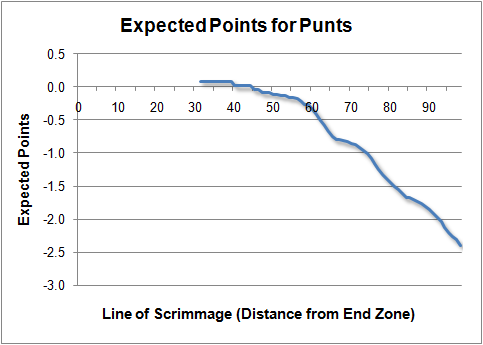 The closer a team is to the end zone, the shorter a punt will tend to be due to touchbacks. 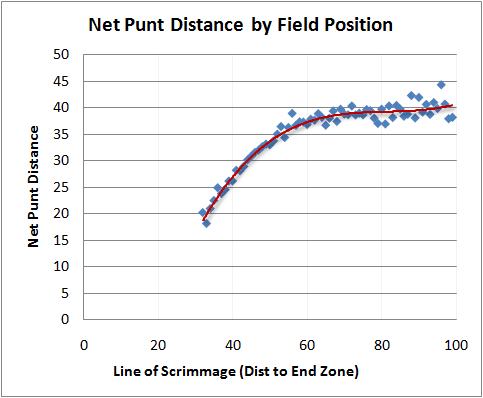 Since we know the net distance of the punt, we know the expected subsequent field position for the opponent. For example, a punt from a team's own 40 (60 yds from the end zone) nets around 37 yards, giving the opponent a 1st down at their own 23. This corresponds to 0.5 EP for the opponent, which is -0.5 EP for the punting team. The EP value of a FG attempt is based on the probability of making the kick, which is dependent on kick distance. Just like taking the highway home from work, we can calculate the overall value of a FG attempt. 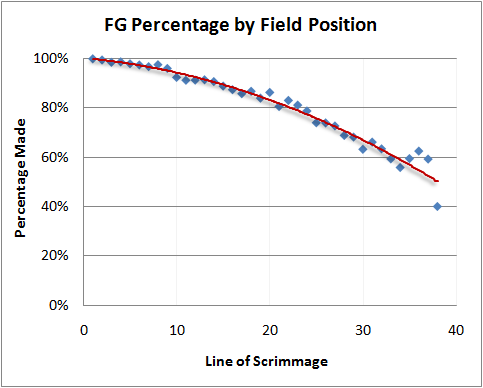 Below is the graph of FG percentage by line of scrimmage. A successful FG is worth 3 points minus the value of the ensuing kickoff for a total of 2.3 points. A missed FG is worth the EP value of a first down for the opponent at the spot of the kick (or the 20 yd line, whichever is larger). The value of a successful conversion attempt would be at least the EP value at the 1st down marker. Often, conversion attempts would obviously go further than the marker, but for now let's consider the minimum value of the conversion. The minimum value of an unsuccessful conversion attempt would be the EP value of a 1st down for the opponent at the spot of the attempt. 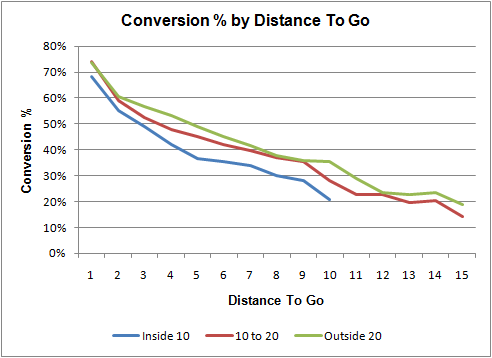 The probability of a successful conversion is primarily dependent on the distance to go. Field position also affects the chances of success due to the compression of the field in the red zone. With less area to defend, the defense's task is easier. The graph below plots the probability of a successful conversion by distance to go, broken out by areas of the field. Let's say you're the coach of a team facing a 4th down and 3 from the opponent's 37. It's early in the second quarter and the score is tied. Should you call a punt, attempt a FG, or go for it? In reality, coaches have called for the punt 100% of the time in close games early in the second quarter. But is this the best thing to do? Let's start with a punt. From the 37, we would expect a net punt distance of 23 yards, coming to the 14 yd line on average. 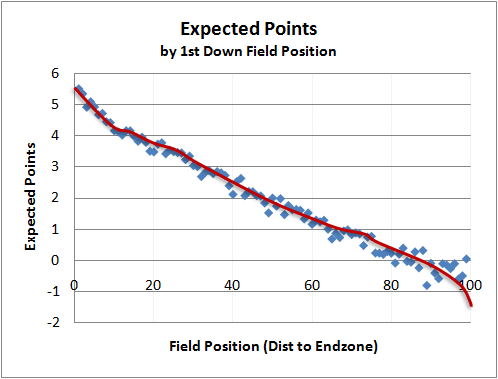 The 14 yd line corresponds to -0.2 EP for the opponent, which is +0.2 EP for your team. So in this example, the best decision is to go for the 1st down. In simple terms, it's worth the risk in the long run. It's not even close. The graph for 'go for it' attempts is a little trickier. 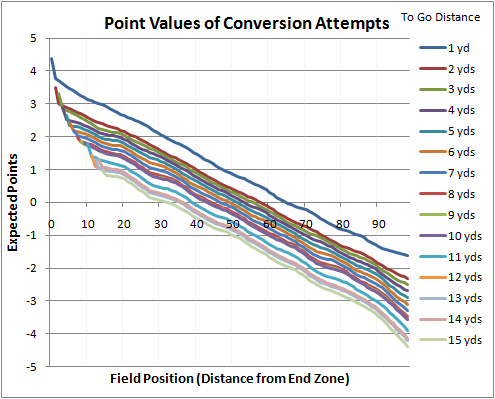 While punts are the same value regardless of distance to go, the value of a conversion attempt is highly dependent on it. The colored curves plotted below correspond to the EP values for each distance to go. Now, let's put it all together and overlay the graphs for the kick values. (Click on the graph to enlarge). Wherever the value lines for going for it are above or overlap the value lines for kicking, the decision should normally be to go for it. 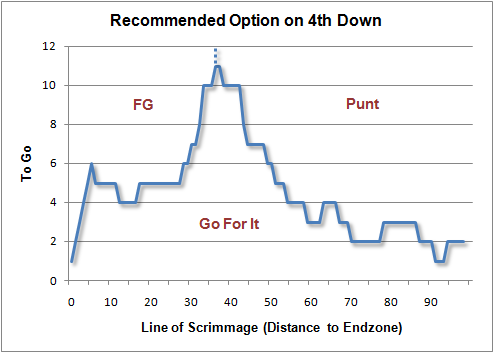 Remember, we assumed a successful conversion would be exactly at the first down marker and no further, which means the tie goes to ‘go for it.’ The final graph below charts the recommended option for each field position and distance to go combination. On the line or below it, a coach should go for the 1st down. That chart is the bottom line, the take-away. It says that coaches should normally be far more aggressive on 4th down. If the benefit of going for it is so clear, why are coaches choosing to kick so often? The authors of Hidden Game of Football suggest that the current 4th down doctrine in football is a hold-over from the early days of the sport. Back in the day, teams were lucky if they mounted one successful scoring drive all game. A good punt basically ensured the opponent wouldn't score on their ensuing possession. David Romer's explanation goes a step further. He suggests that coaches are thinking more about their job security than their team's chances of winning. Coaches know that if they follow age-old convention by kicking and lose, then the players get most of the blame. But if they defy convention and go for the 1st down and fail, even if it was the best decision, they'll take all the criticism. I buy both of those explanations, plus I'll throw in my own take. In addition to the natural conservatism of coaches, I believe much of the reason why coaches don't go for the conversion more often can be explained by Prospect Theory. As I outlined in my Decision Theory article, people tend to fear a loss more than they value an equivalent gain. This is a built-in tendency toward risk aversion means that coaches would be biased toward kicks rather than conversion attempts. Do I expect coaches to do all this math on the sideline? Of course not. What I hope is that some coaches will one day see research like this and reset their baseline 4th down paradigm. All data are from official NFL gamebooks for all non-preseason games from 2000 through 2008. This analysis only applies to ‘typical’ game situations when the score is relatively close, time is not expiring, and weather is not a large factor. With time expiring or if one team has a large lead, a different type of analysis is required. An analysis based on Win Probability can be generalized to any game situation. This type of analysis can be tailored to any team’s specific characteristics, or opponent characteristics. 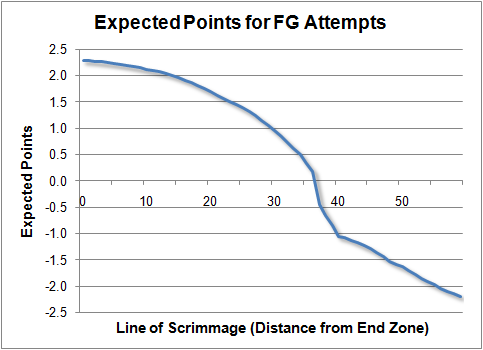 For example, the Expected Points curve, 4th down conversion probability, and FG range and accuracy can be customized to produce a chart specific to a particular game.